Average weekly earnings of non-farm payroll employees were $974 in June, little changed from the previous month, and up 1.8% compared with 12 months earlier. Non-farm payroll employees worked an average of 32.7 hours per week in June, unchanged compared with May, and down from 33.0 hours in June 2016. In the 12 months to June, average weekly earnings rose in 6 of the 10 largest industrial sectors, led by wholesale trade. At the same time, earnings declined in construction, and were little changed in administrative and support services, manufacturing and retail trade. 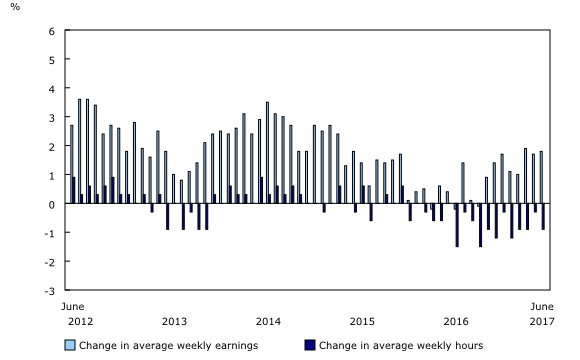 In wholesale trade, average weekly earnings rose 3.8% to $1,199, with most of the increases occurring in the first three months of 2017. The earnings gains were spread across the majority of the sub-sectors. Ontario and Quebec contributed the most to the earnings growth in this sector. Average weekly earnings in public administration increased 3.5% to $1,262, mainly in federal public administration and local, municipal and regional public administration. Coinciding with activities related to the 2016 Census, employment in federal public administration reached a recent high in June 2016, and therefore, on a year-over-year basis, employment in this sub-sector declined notably in June. Among accommodation and food services employees, average weekly earnings grew 3.5% to $388, mainly the result of gains in full-service restaurants and limited-service eating places. Earnings growth in accommodation and food services was spread across most provinces, led by British Columbia and Alberta. Average earnings in the sector have trended upwards since February 2017. In educational services, average earnings rose 2.6% to $1,044, boosted by gains in elementary and secondary schools. Earnings growth in this sector was spread across most provinces. Average earnings in professional, scientific and technical services were up 2.6% to $1,347, with the largest increases in Quebec and Ontario. Computer systems design and related services contributed the most to the growth. For health care and social assistance employees, average weekly earnings increased 2.2% to $883, driven by gains in hospitals. In contrast, average weekly earnings in construction fell 2.1% to $1,200, with speciality trade contractors contributing the most to the decline. 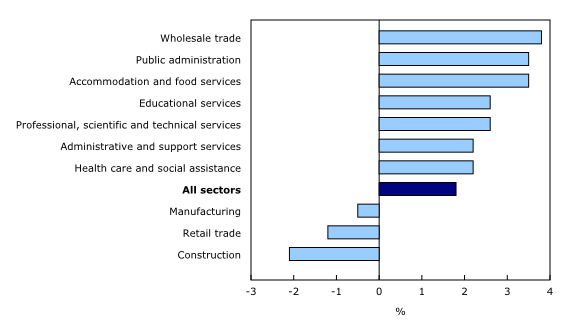 Earnings in this sector decreased notably in Ontario. In the 12 months to June, average weekly earnings of non-farm payroll employees increased in seven provinces, led by Quebec. At the same time, earnings were little changed in Manitoba, New Brunswick and Prince Edward Island. 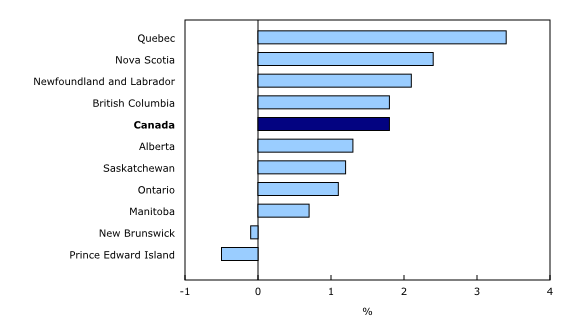 Average weekly earnings in Quebec rose 3.4% to $893. From a relatively low point in June 2016, earnings in the province have trended upward until January 2017. The year-over-year growth was spread across many sectors, and the largest contributors were health care and social assistance, as well as professional, scientific and technical services. In Nova Scotia, earnings grew 2.4% to $857, driven by increases in educational services, and health care and social assistance. Earnings in the province have been on a slight upward trend in the second half of 2016. Average earnings in Newfoundland and Labrador increased 2.1% to $1,046 per week. Construction contributed the most to the increase. At the same time, earnings in the province declined notably in manufacturing. In British Columbia, average weekly earnings were up 1.8% to $945, led by wholesale trade, educational services and manufacturing. Earnings in the province have been on a long-term upward trend. Average weekly earnings in Alberta rose 1.3% to $1,132, with notable gains in educational services; accommodation and food services; and administrative and support services. Earnings in the province have been relatively stable since the summer of 2016. In Saskatchewan, average weekly earnings increased 1.2% to $1,002. Transportation and warehousing; health care and social assistance; public administration, and mining, quarrying, and oil and gas extraction contributed the most to the rise. Earnings in Ontario were up 1.1% to an average of $990 per week, boosted by gains in professional, scientific and technical services and public administration. Earnings in the province have been relatively stable since the start of 2017. The number of non-farm payroll jobs rose by 79,700 (+0.5%) from May. The number of payroll employees increased the most in public administration, mainly in local, municipal and regional public administration. Payroll employment also rose notably in professional, scientific and technical services; retail trade; accommodation and food services; and health care and social assistance. At the same time, the number of payroll jobs declined notably in information and cultural industries. Compared with June 2016, the number of payroll employees rose by 281,000 (+1.8%). Increases were observed across the majority of the sectors, led by professional, scientific and technical services (+39,500 or +4.6%). Payroll employment in this sector has trended upward since August 2016. The number of payroll jobs also increased notably in health care and social assistance (+37,100 or +2.0%), accommodation and food services (+36,000 or +2.8%), construction (+29,900 or +3.1%), and manufacturing (+24,300 or +1.6%). In the 12 months to June, the pace of employment growth has been similar in both of Statistics Canada's monthly surveys with data on employment: the Survey of Employment, Payrolls and Hours (SEPH) and the Labour Force Survey (LFS). During this period, both surveys showed similar trends in employment in health care and social assistance. The number of payroll employees in the SEPH grew 2.0% and has been on a long-term upward trend, while average weekly earnings were up 2.2%. At the same time, the LFS showed growth in total employment in this sector, which has also been on a long-term upward trend. At the beginning of the 20th century, healthcare in Canada was primarily privately delivered and funded. In 1932, there were 33,000 personnel working in hospitals across the country. By 1952, there were 98,000 personnel working in hospitals. It was not until 1957 that federal funding for provincial and territorial costs for hospitals and diagnostic services was established. That year, there were 149,000 personnel working in hospitals across the country. In 1962, the number of personnel increased to 197,000. In the early 1980s, nearly 900,000 employees were working in the health care and social assistance sector, which represented 9.7% of total employees. By 1999, this proportion edged up to 10.4%. However, the distribution of employment in the sector changed over that time. In the early 1980s, employees working in hospitals accounted for more than half of the sector's employment. This proportion declined to 42.0% in 1999, as the delivery of healthcare services evolved. The changing composition of Canada's population, most notably the unprecedented population growth among older Canadians since the early 2000s, has further changed the dynamics of the health care and social assistance sector. This sector comprised 1.9 million employees in 2016, representing 11.8% of all employees. At the same time, of those working in health care and social assistance, 33.9% worked in hospitals. See chart Proportion of payroll employees in health care and social assistance and in hospitals, Canada, 1983 to 2016. For more information on population aging and use of healthcare services, see Health Care Cost Drivers: The facts. Ottawa: Canadian Institute for Health Information, 2011. Sources: Canada's Health Care System and the annual report of hospitals in Canada for 1932, 1952, 1957 and 1962. Real-time CANSIM tables 281-8023, 281-8026, 281-8047 and 281-8063 will be updated on September 11. For more information, consult the document Real-time CANSIM tables. Data on payroll employment, earnings and hours for July will be released on September 28. Job Vacancy Statistics (5202) from the Survey of Employment, Payrolls and Hours for May are now available in CANSIM. To enquire about the concepts, methods or data quality of this release, contact Emmanuelle Bourbeau (613-951-3007; emmanuelle.bourbeau@canada.ca) or Client Services (toll-free: 1-866-873-8788; statcan.labour-travail.statcan@canada.ca), Labour Statistics Division.